Mechanical keys on a ring are exposed to a great deal of physical abrasion. Polyester adhesive backed barcode labels will not survive . 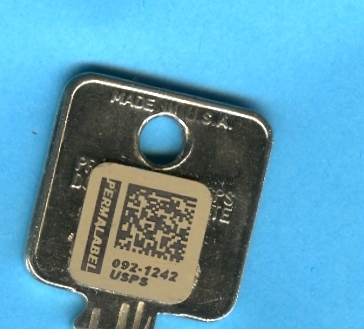 Pictured below is a key labeled with an adhesive Permalabel® Aluminum Label which is laser marked sub surface under an aluminum oxide layer and is therefore very abrasion resistant. Because the label is hardened aluminum , it is very difficult to lift an edge.